The VI-TREK Folding Exercise Bike has been expertly designed to provide the most efficient work out at home. Perfect for beginners as well as experienced exercisers because it provides a low impact training method that will benefit anyone looking to improve cardiovascular fitness, develop and tone leg muscles and at the same time help with weight loss. 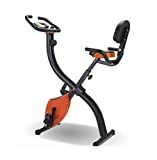 This great quality exercise bike features a digital console which provides a range of information about your workout including: time, speed, distance, calories, scan and heart rate when using the handheld sensors. There is an adjustable padded saddle with back rest which provides extra comfort and can assist in reducing upper body strain. There are different levels of manually controlled resistance which allows you to adjust the intensity of your workout and because it has a cast iron magnetically operated flywheel it is friction free and provides a much smoother and quieter operation than some cheaper models. The VI-TREK Folding Exercise Bike is a very sturdy piece of equipment built from commercial-grade material, so it is very strong but also light enough to fold away for easy storage, making it ideal for home use and for transporting. A 30 day returns option plus a 12 month full replacement parts warranty is included and full assembly & training instructions in English are provided. Main Features: Excellent quality Folding/Portable/Space efficient Adjustable padded saddle with back rest Large pedals with straps Multiple levels of resistance Handheld pulse sensors Digital feedback for time, speed, distance, calories, scan & heart rate Low noise operation Maximum weight of user: 100kg. Net weight: 18.8kgs Flywheel: 2.5kg Magnetic Resistance Requires 2 x AAA Batteries for the digital console (included) Assemble dimensions: 126 (H) x 99 (W) x 53 (D) cm. Folded dimensions: 140 (H) x 50 (W) x 31 (D) cm. Warranty included 12 months parts. Some self-assembly required.